The epic battle between the hilarious Deadpool and the gruesome Carnage comes to an end in this last part of the series. I was a fan of this series, and I must say, the conclusion was a little anti-climactic. This four part series follows Deadpool as he tracks down Carnage, and every issue seems to get more and more violent than the previous one, which I loved. During this last issue, Carnage manages to best Deadpool by ripping him to shreds with a crop-cutting tractor. 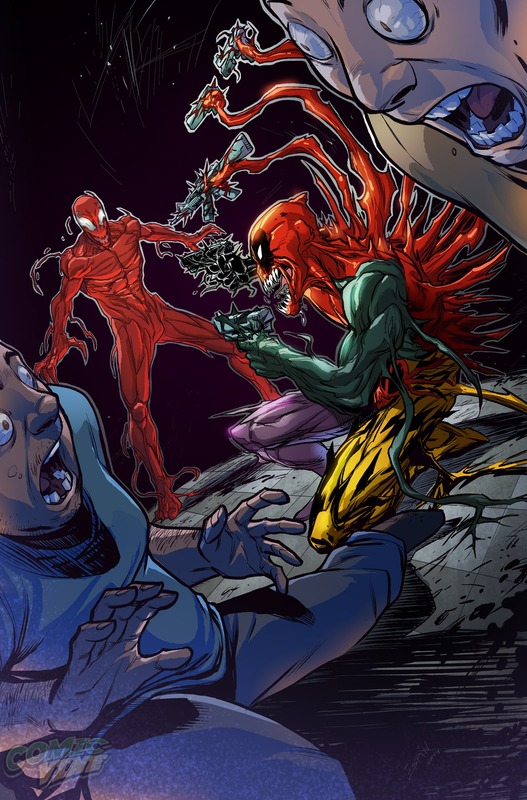 Little did Carnage know, all four symbiotes from the recently slaughtered Mercury Team found a new host–Deadpool. The final showdown between Carnage and Deadpool ironically took place in a mental institution (because they’re both psychotic). 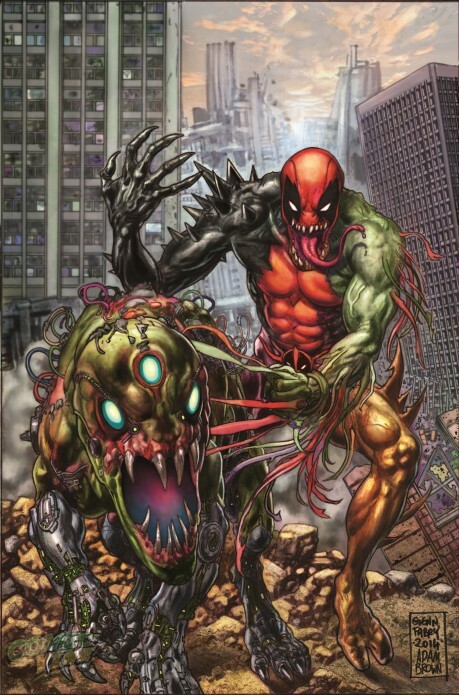 The new and improved four-symbiote Deadpool was a really cool idea, giving him awesome new powers so he can finally be an even match for Carnage. Carnage and Deadpool exchanged many good blows to each other, including Carnage practically getting his head blown off and Deadpool having to put his intestines back into his body. Salva Espin did a great job illustrating this series, capturing every little gory detail for us readers to enjoy. The only part in this issue that let me down was the conclusion. Deadpool uses one of his symbiote powers to cloak Carnage’s new lover, Shriek, to look like Deadpool. 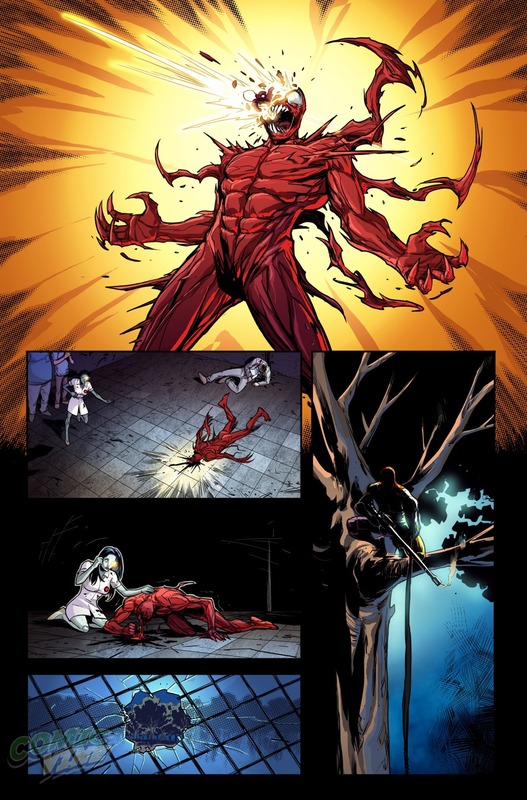 Fooled by the illusion, Carnage attacks Shriek and completely mutilates her. Discovering what he did, Carnage loses his mind and instead of going after Deadpool, he locks HIMSELF in a prison cell until he can get his mind straight. I wasn’t expecting one of them dying in order for there to be a winner, but that ending could have been better. Even though the ending was a let down, the rest of the series was very entertaining, and I recommend it to anyone who enjoys Carnage or Deadpool.